Each year in the lead-up to the holiday season, Toronto’s arts and crafts–loving hordes descend on the Direct Energy Centre at Exhibition Place to spend hours browsing the One of a Kind Christmas Show and Sale. On from November 24 to December 4, the massive event features hundreds of talented Canadian artisans showcasing their best wares, from designer apparel and unique accessories to glassware, works in metal and more. The sheer selection can be overwhelming, so in advance of the show, Where Toronto offers our 15 favourites. Partners Ted and Carol Devine offer their collections of rings, pendants, bracelets and more with materials such as sterling silver, gold, pearls and semi-precious stones. Custom designs and men’s jewellery are also available. The clever name refers to both this artisan company's location and product of choice: high-quality and creatively blended teas at an affordable price. Try their rich tiramisu rooibos or butter-truffle black tea, or choose something more traditional like an aromatic Himalayan Darjeeling. Metalsmith Scott Wilk’s background in fine art is clearly seen in the workmanship of his stainless steel watches. A student of horology, Wilk handcrafts his intricate watches with the utmost precision. In addition to his Swiss-movement timepieces, he also makes stunning custom jewellery and cufflinks. In her Distillery District studio, Sarra Tang makes chic handbads using a variety of techniques to create different textures and shapes. The sculptural bags are handcrafted, of course, ensuring the highest quality of care is given to each piece. This indie clothing company is the brainchild of two artsy best friends. Their mission is to create limited-edition clothes and accessories that double as wearable works of art—thanks to their endearing yet quirky prints. Toronto chocolatier Odile Chatelain has spent nearly 30 years in the ultra-competitive confections industry, and specializes in handmade truffles with unique blends of herbs, spices, liqueurs and more. Intriguing flavour combinations like raspberry-vinegar and lavender-caramel are beautifully decorated according to their enticing taste. Toronto's Monster Factory, operated by Bliss Man, Adam Dunn and Rhya Tamasauskas, churns out cute plush toys for kids—and their hipster parents—in a range of shapes, sizes and colours. The handmade creatures—almost 100 in total—are arrayed in different series, including earthings, herbivores and "peabodies." This self-styled beauty enthusiast offers a full range of PETA-approved products including foundation, blush, lipsticks and more. Worn by celebs such as Rachel McAdams and Dolly Parton, DaLish has also been featured in Canadian magazines like <em>Fashion</em> and <em>LouLou</em>. Artist Lesley-Anne Green applies her background in sculpture to making whimsical felt critters. With lions, foxes, owls and more, Green’s menagerie knows no bounds. The small animals are perfect gifts or great collectibles for any home. Quebec-based glass artist Karine Demers creates blown-glass pieces in colourful organic forms inspired by human nature and emotions—made plain by the whimsical drawings that are incorporated into each piece. Working with boiled 100 per cent merino wool and natural dyes, Julie Sinden makes hats, scarves and mittens designed to keep you warm and, well, cute as a button. Cambridge's Ashley Coulson is a self-proclaimed paper lover; her passion is evident in her intricate Flakes Paperie stationery, greeting cards and other paper goods, which are screen printed by hand with unique designs. Quebec designer Eve Gravel has been creating ready-to-wear fashions for women since 2002. Her clothes explore femininity by playing with shape and fluidity in her preferred colour palette of black, grey and white. Gravel uses a variety of fabrics, but her eye for detail adds the finishing touch to each look. Featured in countless magazines, including <em>House Beautiful</em>, <em>Canadian Family</em> and even <em>Where Toronto</em>, Avril Loreti designs home accessories and decor items. Her playful interpretations of basics such as towels and napkins—pop art influences and iconography add colour and character—sets her pieces apart from typical department store wares. Lucier and Mongeau's Montreal-based company specializes in glass and ceramics that are both creative and functional. Their glassware creations—like oil drizzler and citrus juicers—are available in vibrant colours that add zest to any kitchen. Amelie Lucier & Julien Mongeau of A.J. MARCH 16 TO 20 Surround yourself with six verdant acres of colourful blossoms and plants at Canada Blooms. The festival of flowers and gardens features numerous vendors catering to the green thumb in everyone, as well as more than 200 hours of seminars, workshops and demonstrations with such speakers as Frank Ferragine, a.k.a. Frankie Flowers, and author Mark Cullen (The Canadian Garden Primer, An Organic Approach). Check out the stylized Juno Rocks Gardens—interpreting the theme of “rhythm” in honour of this month’s Juno music awards. Exhibition Place, Direct Energy Centre, general admission $18; call 416-447-8655 or navigate here for further details. Rodgers and Hammerstein’s beloved, Tony Award–winning musical South Pacific has returned to charm audiences at the Toronto Centre for the Arts. This timeless tropical-island tale follows four lovers who must overcome adversity against a backdrop of World War II. The Canadian International Auto Show has rolled into town and parked at the Metro Toronto Convention Centre. Rev your engines while admiring the latest consumer, luxury and concept cars. Classic cruisers and environmentally friendly vehicles are also on display. Get your eyes—and ears—ready: the Art Gallery of Ontario’s Juno Tour of Canadian Art opens today, to mark the 40th anniversary of Canada’s music awards. This innovative project pairs great Canadian art—as well as the AGO’s collection of Henry Moore sculptures—with tunes and commentary from Juno-winning musicians. A Greek tragedy gets a Canadian twist in tonight’s performance of the Canadian Stage Company’s St. Carmen of the Main. This unique play Carmen leave Nashville and return to her roots in Montreal, where she sings of the hustlers and whores who attend her nightclub shows and sees those on the fringes of society become the heroes of her songs. Classical music is always in fashion at Roy Thomson Hall, where the Toronto Symphony Orchestra presents masterworks by Brahms and Dvorak. Estonian conductor Eri Klas and Israeli violinist Vadim Gluzman are featured in this evening’s performance. The National Home Show has set up shop at the Direct Energy Centre. Don’t miss an appearance by interior design expert Debbie Travis today at noon, followed by a book signing. Afterwards, check out many other design and renovation features including a futuristic glass house built by Concept PolyHome. 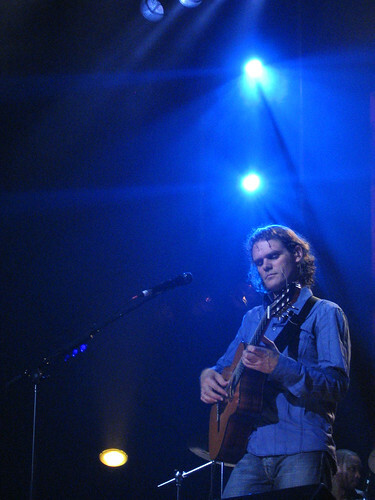 Those who head to Brampton’s Rose Theatre tonight are rewarded with a lively performance by Jesse Cook. The Toronto-based nuevo flamenco guitarist has is renowned for his sensuous picking and strumming, showcased most recently on his Juno-nominated album The Rumba Foundation. Experience the avant-garde as Los Angeles–based art collective My Barbarian offers its Post-Living Ante-Action Theatre performance at Buddies in Bad Times Theatre. Starting at 2:30 p.m., the show draws on current events and politics—and references avant-garde theatre collectives of the 1960s—to create an interdisciplinary work of art. Sway to the sultry sounds of R&B-gospel-jazz vocalist Liz Wright, who performs music from her latest album, Fellowship, at Glenn Gould Studio. FEBRUARY 18 TO 27 Colin and Justin of HGTV’s Home Heist are among the guests at the National Home Show, which offers ideas for pros and do-it-yourselfers alike. Direct Energy Centre, $12 to $16; call 416-644-5400 or visit here for details. The weekend immediately following the revelry of New Year’s is a quiet one for many people. But if you’re still itching to get out, Toronto’s got you covered. Start your weekend with some drama courtesy of the annual Next Stage Theatre Festival. Tonight’s programming includes a history of personal combat in Duel of Ages and the intriguing whodunit Fairytale Ending. Treat the family to a visit to the Art Gallery of Ontario. Among its numerous current exhibitions is a collection of four shows united under the title Animal Tales: Beasts, Toys and Fables. These displays feature bright and dynamic images celebrating the magic of visual storytelling, and particularly emphasize the fables of Aesop and the illustrations of Walter Trier. The Second City has extended performances of its latest hit, Something Wicked Awesome This Way Comes. Act fast to get tickets—you don’t want to miss out on discovering just how awesomely wicked this show really is. It’s not to early to think about summer—and, particularly, how you’ll spend time on the water. So make your way to the Direct Energy Centre, which hosts the Toronto International Boat Show. Among the expo’s highlights are the world’s largest indoor lake, which features wakeboarding and boat-handling demonstrations. Step back in time a couple of decades at the Horseshoe Tavern, which celebrates Canadian music of the 1980s as part of the Juno Decades 40th Anniversary Concert Series. Featured artists include Maestro Fresh Wes and Platinum Blonde. Take a spin around Harbourfront Centre’s Natrel Rink tonight while DJ Medicineman drops a hot mix of global grooves and electro hits. The pulsing music is sure to take the edge off of winter’s chill. Just west of the city, Mississauga’s International Centre hosts the North American International Motorcycle Supershow, featuring more than 500 exhibitors and 1,000 motorcycles. These bikes will excite as you ride on over for seminars, a showbike competition and more. Whether on foot, by car, or on the back of a beast, be certain to travel to the Ontario Science Centre. Its Mythic Creatures: Dragons, Unicorns, and Mermaids exhibition, which explore the mystical world of the mythical creatures, concludes today. Welcome the Toronto Raptors as they return from the road. Today the National Basketball Association squad—featuring rising stars like Andrea Bargnani and DeMar DeRozan—take on the Sacramento Kings. APRIL 23 TO 25 Browse more than 400 vendors showcasing environmentally friendly products and services at the Green Living Show. Sample biodynamic wines, test drive fuel-efficient hybrid vehicles, learn from eco-activists presenting on the main stage and watch as farmers and top chefs like Michael Steh (of Reds Bistro) whip up a feast. Exhibition Place, Direct Energy Centre, $8 to $12; call 416-360-0044 or visit here for further details. a Kind Spring Show and Sale. Though housed in a massive exhibition hall, this is no department store shopping excursion: face-to-face interaction with the creators of handcrafted jewellery, clothing, home decor pieces, visual art, toys, organic food items and beauty products adds a personal touch—the makers are often eager to share the stories behind their unique goods. Among the pick-up possibilities are charming hats by This is J, aromatherapy candles from Golden Goose Naturals and napkins with local landmarks by Avril Loreti. Exhibition Place, Direct Energy Centre, $6.50 to $12; call 416-960-4515 or check out this site for more information and tickets. MARCH 17 TO 21 For those who can’t wait any longer for spring to arrive, Canada Blooms provides a sanctuary in which to worship the season’s stunning colours. Here, budding gardeners and veteran green thumbs alike can take pleasure in more than six acres of landscaped gardens, as well as a 100,000-square-foot marketplace with retailers selling everything from patio furniture to flower and vegetable seeds. Edifying workshops and seminars by Canadian horticultural experts are also offered daily. Direct Energy Centre, $14 to $18; call 416-447-8655 or click here for more information and to purchase tickets.